The Boathouse Phuket is not a ‘juggernaut’ resort. 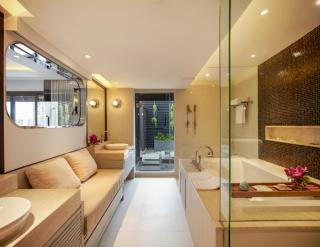 In fact, it is what is fashionably known as a boutique hotel – 39 rooms to be precise. But it has two inestimable advantages: one, god-given, is its unique location; the other, man-made, is its legendary reputation for hospitality. Created three decades ago by Thai visionary Mom Tri Devakul, it was the first five-star hotel in Kata, located in a dominant prime beachfront position. 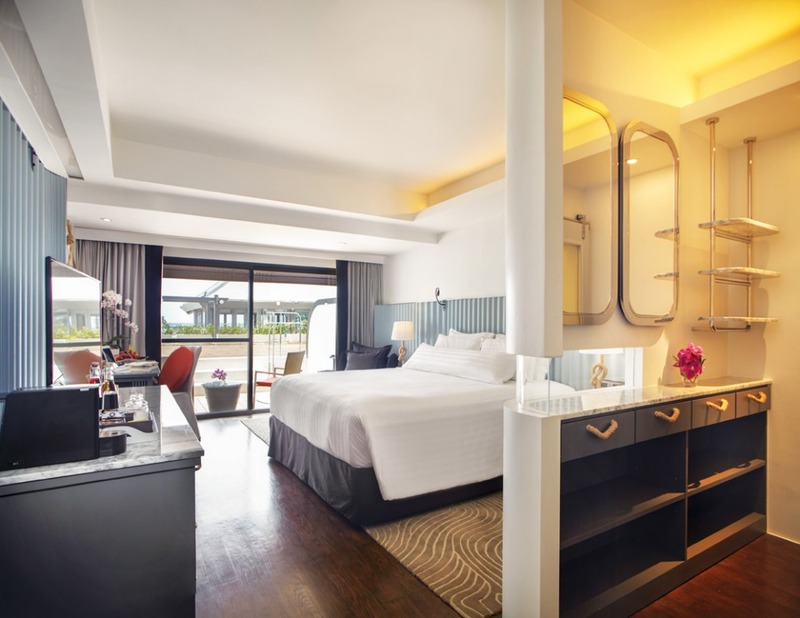 Originally a venue for boat owners – hence the name – it may still be ‘anchored’ between the road to Kata Noi and the Andaman Sea, but as a consequence, every one of its splendidly appointed suites enjoys a seaview. A warm welcome provides the perfect entrée to The Boathouse experience. Greeted at reception by unfailingly courteous staff – and the courtesies are maintained for the rest of our stay – we are invited to enjoy a pre-prandial cocktail. The choice is huge: complex concoctions include the signature Boathouse Cocktail based on camomile gin, vermouth and cola syrup, but my choice is a classic rum mojito which comes in a tankard with wedges of lime and mint. So refreshing. The house list of spirits is equally impressive: nine whiskies by the glass, half a dozen gins and vodkas, five tequilas, even seven varieties of mineral water. The Boathouse’s nautical theme is accentuated by a rope framed circular mirror, a standard lamp with – yes – rope fittings, and by grey, wavy textured headboards that echo the pleated curtains and accentuate the seafaring motif. But the emphasis is squarely on traditional comfort: a huge sofa with piles of colourful cushions set in an inviting alcove, a luxurious double bed, a spacious desk, armchairs, deep woollen carpets and wooden floors. The attention to friendly detail is everywhere apparent: a personally written letter of welcome from the general manager, Max Chin, is reinforced by an illuminated television greeting. On the coffee table is a message saying “Welcome Home”. It does not seem inappropriate. There are bowls of fruit, biscuits and sweetmeats, a coffee machine, a safe, a range of elegant toiletries, thongs and slippers, sumptuous terry towelling – even a mosquito spray. A tablet lists an array of illustrated features and activities, which naturally include free wi-fi. The fridge is amply stocked and a bottle of wine awaits the new guest. No stone is left unturned. The Boathouse has an intimacy and compactness that few luxury establishments can hope to match: one can walk from prow to stern in minutes; a scenic beachside stroll from the grand reception area through the main bar, with its nautical motifs, past the elegant restaurant where one can either dine in air-conditioned comfort, or caressed by ocean breezes beneath arching sea almond trees. 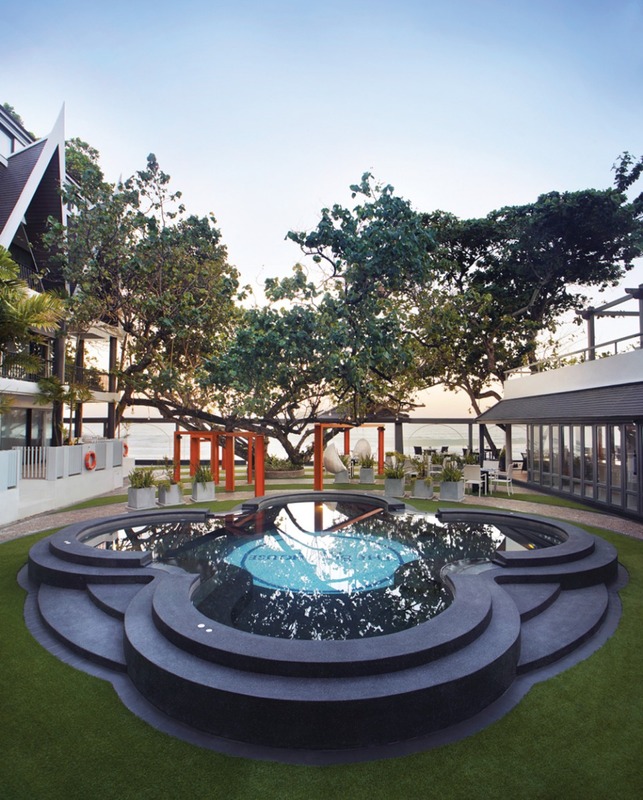 On to a serene courtyard flanked by palms and terraces with its unique, four-leafed jacuzzi pool; beyond to a sunbathers’ paradise with rows of white, parasolled sun-beds clad in blue livery next to a crescent-shaped infinity pool. 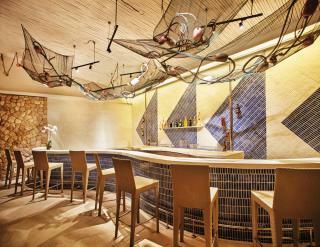 The area is flanked by a matching pool bar serving appetising snacks and drinks. If you want privacy, there is a sala next to the beach and even a secluded dining room. Dinner is enjoyed at the sea’s edge – literally. There is a choice between dining next to the picture windows in air-conditioned comfort, or embracing the salty tang and visual impact of an al fresco experience. 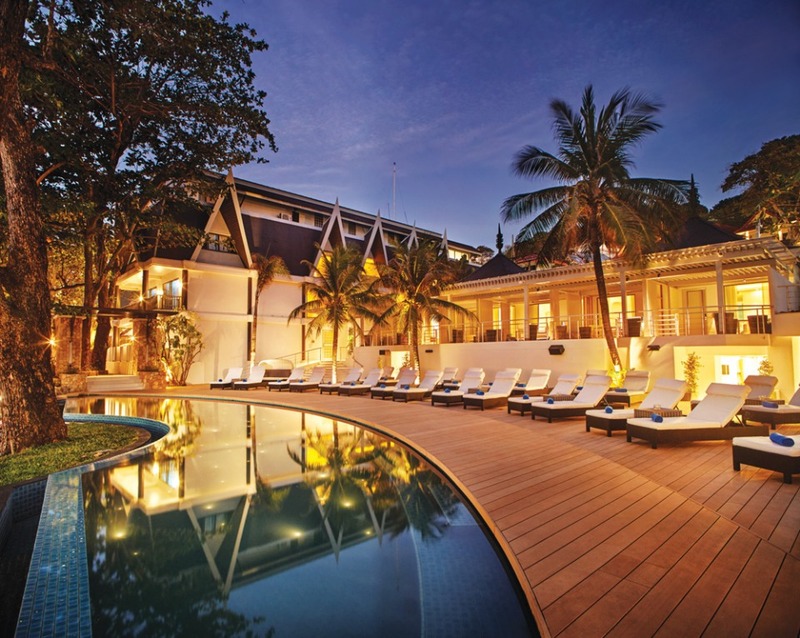 We choose the open air, where the view extends in a wide, wooded, right-hand sweep to the distant Karon headland and left to the fairy lights of another hostelry. While Phuket boasts many fine maritime vistas, nothing can quite match The Boathouse’s location. After all, it was there first. Featured in every recent edition of Tatler’s ‘Best Restaurant Guide’, The Boathouse has been synonymous with fine dining since its inception thirty years ago. Now owned by a Singapore group (HPL), iconic standards of culinary excellence are zealously maintained. 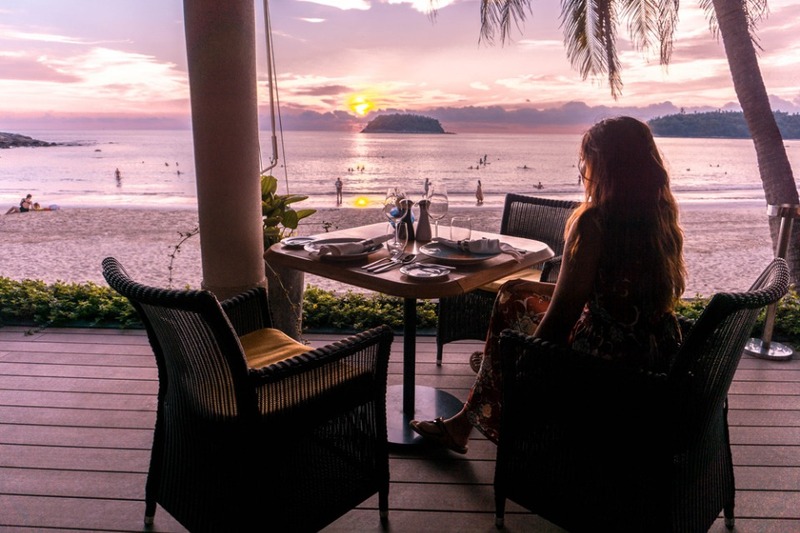 The five star restaurant boasts an extraordinarily wide selection of dishes, based predominantly on classic western and traditional Thai cuisine. 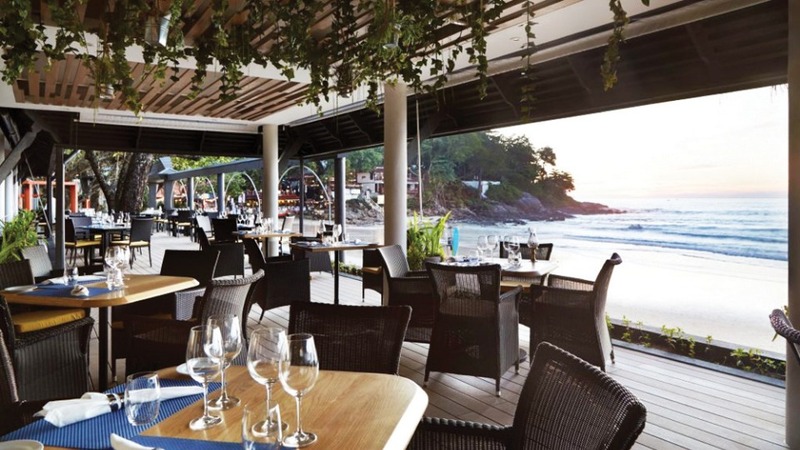 Unsurprisingly, since it is The Boathouse, and since it has a frontage literally a step away from the whites sands of Kata Beach, the menu – like the décor – also genuflects to matters maritime, with its emphasis on freshly-caught seafood and fish. We are first presented with an amuse-bouche of creamed vegetable soup and spoonfuls of cordon-bleu pork, accompanied by a glass of Freixinet ‘bubbly’. Aware of the generosity of Boathouse portions, I try not to over-indulge. But both soup and sparkling wine are stimulating appetisers. For an entrée, my partner, who sometimes assesses a meal by the quality of a particular dish, chooses her favourite Caesar Salad. It meets with her total approval: lots of crisp lettuce and bacon, croutons, parmesan cheese and even a poached egg. From the Thai set menu, my tiger prawns are skewered on a bed of egg plant and young lemongrass. It is clear that the chef is especially keen on crunchy textures as well as surprising flavours: my next dish is a beautifully presented offering of crispy duck breast with tart lime slices and tiny green aubergines. Innovative. 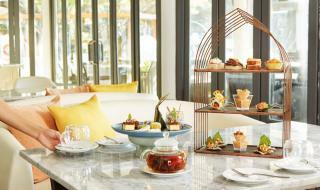 But the real ‘pièce de résistance’ comes with our main dishes. Wan’s choice of Gaeng Kati Poo, from the Thai Favourites list, is a sumptuously creamy crab curry, flavoured with betel leaves and accompanied by jasmine rice. I cheat a little: my choice is something familiar. But the Lamb Shank Massaman is such a superb dish, I want to revisit the gustatory experience. Made, unusually, with one of the choicest lamb cuts, it is accompanied by sweet potato purée and a rich, robust, sauce. 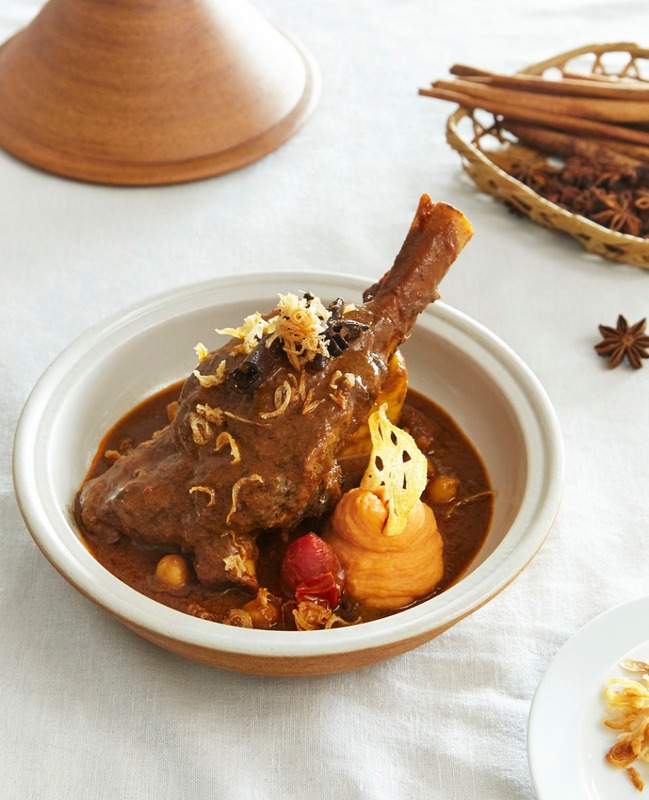 The tender meat, slow-cooked for many hours, melts in the mouth. Exquisite. We finish with a palate-cleansing Pineapple Confit with passion fruit sorbet. Very refreshing and an appropriate conclusion to a memorable meal. 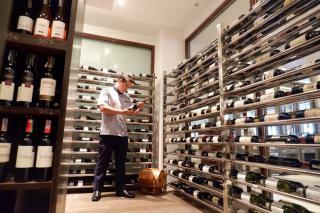 The Boathouse has been the recipient of the prestigious ‘ Wine Spectator Award of Excellence’ every year since 2006. The wine cellar, tantalisingly viewed from the main bar, boasts more than 600 unique labels from more than seventeen wine-making countries, including Thailand. 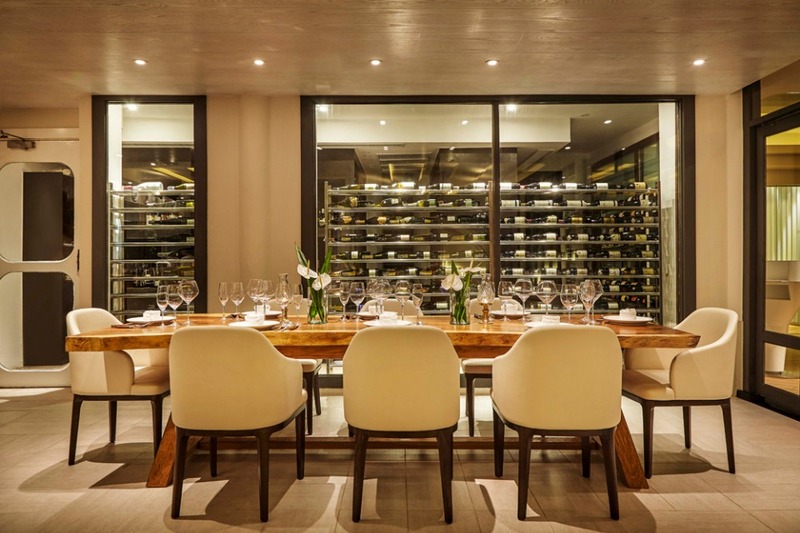 The list is catholic – everything from Chilean Cabern et to legendary Petrus. 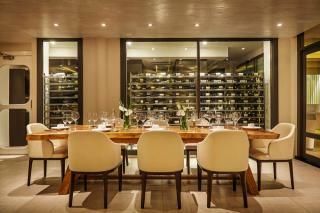 Fifteen wines are available by the glass – a thoughtful touch. Fittingly, it is a Thai wine, recommended by the sommelier, that we choose for dinner, a 2015 Heritage Shiraz from Monsoon Valley. Plummy and well-balanced, it proves an inspired choice. Breakfast is predictably wide-ranging. 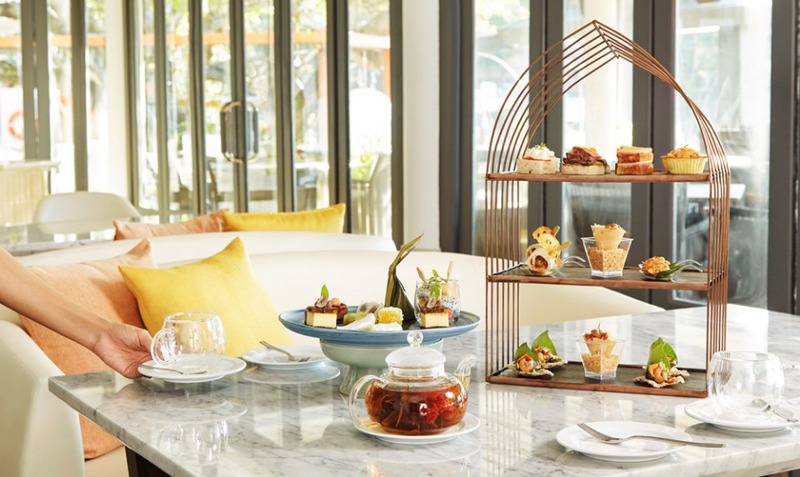 Everything from traditional bacon and sausages to pork patties, Thai savoury rice and stir-fried noodle dishes – even prawn congee – complemented by cereals, a delectable range of breads and fruits, freshly squeezed juices and superlative coffee. Lunch is taken in yet another of the five dining venues, next to the bar. Again the nautical theme dominates: above the bar is a row of portholes; behind the counter is a charming and restful vertical pattern in white and contrasting shades of cerulean blue and sea green. The staff sport striped tops and navy blue pantaloons; even the table mats are blue and white. The menu offers a range of cold starters, including ten Western selections, ranging from Organic farmed salad and Avocado shrimp cocktail to such exotic fare as Beetroot cured salmon and Tenderloin carpaccio. There are seven Thai delicacies including the classic Som tam with prawns and Larb ped (minced duck with galangal). Even a selection of hot soups. But sated after a delicious breakfast, we decide on a single main course. My choice, suitably maritime, is Grouper fillet; it arrives in a spicy tamarind and lemongrass sauce which perfectly complements the crisp and tangy fish. My partner opts for a Thai dish of spicy minced beef and rice which she pronounces delicious. But the choice is high, wide and handsome – twenty spectacular offerings, half of them based on seafood or fish, dishes to suit every palate. And if you want something different, there is always the appetising Thai Pinto lunch set – a selection of small bowls, including aubergine based dishes intended for sharing. 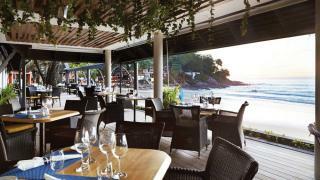 Located by Koktanode Road, restaurant with Kata Beachfront.